I literally finished this book about 30 minutes ago and I am still grasping for air. Amazon synopsis: The Last Time They Met opens with two old lovers, both poets, running into each other at a writer's conference. Well, Linda Fallon and Thomas Janes aren't old, actually--just middle-aged, with a lifetime's worth of history between them. In the first section, Anita Shreve only suggests what that history contains: there was adultery, we gather, and a car accident, plus some illicit encounters under a pitiless Kenyan sun. We think we know where this is going--but that's the tricky part, because we don't. Amazon's synopsis could not have explained how I feel about this book any better than it already did. This was one of the books that B's mom left with me to read. I actually picked it up once after finishing Harvesting the Heart by Jodi Picoult but could not easily transition from Picoult's easy writing to Shreve's complex. I was bored and thought her writing style was ridiculous and unnecessary. It is clearly evident that she is a very skilled writer... but at the time... I felt she might be a little too skilled for me to enjoy... I was bored with the story and I was having to determine the definition of words far too often for me to enjoy it. I decided to pick it back up several weeks later and give it another shot... and I'm glad I did. As the synopsis mentions, it is rather slow moving in roughly the first 100 or so pages. It wasn't until the characters encounter in Kenya that I really got drawn into the story. The story is told in reverse chronological order... their first encounter being when they are older... their second encounter as young adults... and their first as teenagers. I enjoyed this style of writing because I was hooked on their characters and their story at a time when readers are usually just getting a glimpse into their lives. The story's ending is what really makes this book worth reading... and as I got closer and closer to the end of the book... I kept thinking to myself... how is this story going to end? It didn't seem there was enough time or an adequate number pages to create an ending that would be remotely satisfying. Oh, but all it took was one. I am definitely anxious to go back and read the book for a second time to fully understand how it all played out. I have never felt the need to do that with another book before and that says something in itself. I definitely recommend it to any and all... and I ask you to be patient with the first first 100 pages. It all seems boring and somewhat irrelevant to the story but I promise that it makes sense once the book is finished. 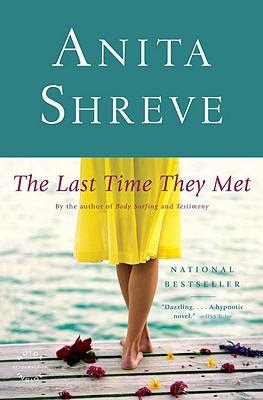 I love love love all of Anita Shreve's books!